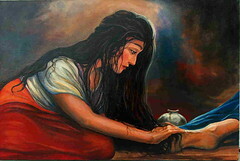 One tenderly washes his feet with her tears and then dries them with her hair, an act of loving service that, according to Jesus, demonstrates her unique understanding of his message. Another breaks open an expensive jar of perfume and anoints him with it. Apparently she was the only one of his disciples who understood and accepted the predictions he had made of his imminent arrest and execution. She symbolically prepares him for his upcoming death and burial. Again, she is held up as an example to his other disciples. According to the three synoptic Gospels, the only friends of Jesus who stayed throughout his ordeal on the cross were the women. Again, it was women who went to care for his body in the tomb. And there it was women to whom it was first revealed that he had risen. It was these women who first encountered the risen Christ and were first given the task to preach the Good News of his resurrection. And yet when they arrived at the place where Jesus’ male friends had been hiding, no one believed them, no doubt in part because these messengers were lowly women. Saint Paul said (some time before the Gospels were put down on paper) that “There is neither Jew nor Greek, slave nor free, male nor female, for you are all one in Christ Jesus”. Yet up to this day there are still large segments of the church who believe that woman lack the gravitas to teach and lead. Perhaps if woman had had a larger voice in God’s ministry, something Jesus seemed to have desired, then the church may have done a better job of sharing the Gospel with the world. This entry was posted on February 10, 2008, 11:12 am and is filed under Bible, Christianity, Church, God, Gospel, Jesus, Justice, Religion, Spirituality, Theology. You can follow any responses to this entry through RSS 2.0. You can leave a response, or trackback from your own site. “That ain’t chili!” I called down the bar. And with that, the great chili duel was on. “Well that’s good enough! I’m pleased to meet you,” said the seal, extending his flipper. “Pleased to meet you, sir,” said I, giving my name. “Carroll Shelby.” said the King of All Seals. “Yessir,” was all he said. And suddenly things started to fall into place. We ordered another round of brandies and laughed at how we’d been struck with the same hankering to flip the bird to Generalisimo Santa Ana in Sacramento, and we bragged on our chili like a four-alarm fire. That genteel Hungarian surely must’ve thought we were about to come to blows, but it was just one chilihound’s way of sniffing the tail of the other chilihound, and we knew that and the Hungarian didn’t, so we were happy as any two chilihounds could be this side of a hog-stomping mudwaller on a Summer’s day with skinned knuckles and half a beer buzz. As the dinner crowd began to collect in the old restaurant with the flambe tables and the flocked wallpaper, the great Overlord of Overdrive, the Maharajah of the Muscle Car, the Inspiration for Aspiration, recognizing that we’d bluffed and blustered ourselves to impasse, exchanged business cards and shook my hand in parting. A week later a package from him arrived unexpectedly. It contained a membership card, and certificate suitable for consecrating, declaring me henceforth and forevermore a Charter Chilihead of the International Chili Society. Mr. Shelby had appended a courtly note reminding me what he thought of statehouse swellheads who presume to tell a person where to smoke when they can’t even tell a bowl of red from a sandwich spread. Against that man, a draw is as good as a checkered flag. Where chili braggin’s concerned, anyway. Good God, man! At first I thought you were recounting a dream, what with the seals and the flippers. But did you actually break bread with Carroll Shelby? I am in awe. Yeah, it’s all true, even allowing for a certain Pecos Declination of the truth. I’ll commit sheer heresy and offer a couple pointers I’ve picked up, if you’ll swap me the recipe for your Lester Maddox Chili. You can leave out one ingredient if you want to be as low as a Texas sidewinder and as secretive as a Comanche. I never did compete, but just got invited to join a pretty formidable team. So, you’re ahead of me. Oh, the transmogrification of Shelby -> walrus -> seal. Well, when you do come across CS, you’ll find that from ten paces he’s a bellowing walrus; from two, but a barking seal. Now please don’t tell him I said that, or he’s liable, in his Eighties, to grind me into a frothy pulp, pour me into his radiator and still win the Baja 500. Saving my shell for chili, of course. Lester Maddox? Oh – I get it! It was an open competition up here and consisted of mostly ‘amateurs’ (but pretty capable amateurs, let me tell you). We were one of the few restaurants to compete. Ostensibly I was there for the marketing potential. I was actually there for the chili. And beer. Well, I’m late to the party as usual. I can count on Christian to stir up the pot. I read through about half the comments so if I am repeating… well feel free to move along. Third: In my life experience of 48 years the most influential people responsible for showing me Christ while I was lost are (in order of my priority): mom, grandma, and Leah Man my adult sunday school teacher (from 1998 – 99). That’s it. Prior to my conversion there is no Godly male figure in my life. I wonder how many (in today’s world of divorse and dead-beat-dads) have similar stories? And I wonder then who IS leading in God’s eyes (not in title or earthly organizations)? Are all the parts of the body ALREADY engaged and doing their part? So based on my limited experience, I would like to meet and chat with Billy Graham’s mom, grandma, and sunday school teachers … when I get there. Sure, Ric. I/m not suggesting that women haven’t been influential leaders in the ‘true’ Church, the one that we meet on the road and in our homes. But that the more ‘visible’ official church missed the boat by excluding women from their offices. You brought up another way in which the church has missed the boat, elevating clergy to an exhalted status. Ric, I myself was fatherless as a child. From earliest memory I construed my heavenly Father as my Papa, my Pop, my Opa, my Abba. I can still feel my undeveloped little right arm, a phantom limb now, reaching skyward that He might take my hand in His. As He always has done so just as promised, I never have failed to trust Him, and never have understood why people should wish to be “God-fearing”. He doesn’t frighten me. On the contrary, He’s my Dad. We get along great: I put my trust in Him, and He never lets me down. We’re tight that way. For some reason I presume to feel rather proud of the mature way in which the bloggers here have discussed the Feminine and the Masculine in the mystical Church and the visible one. I balk at offering a summative account of this rich and caustic and yet nuanced hurly-burly of a conversation, but I do want to pick up on two of your points, Ric, if I may. Papal splendor. Got no problem with it, as long as it is the office, and not its occupant, that is exhalted in service of the Lord over all lords. In Him I can honor the sheep and the shepherd alike. Queen Victoria, asked what she would do were Christ to return during her reign, replied that she would of course lay her crown at His feet. I don’t doubt that the late Karol Wojytyla, His Holiness Pope John Paul II, would have vacated the Throne of St. Peter for Him also. But Christian uses an interesting word, status, that carries great meaning in Sociology. His use of that word brings Pharisaic images to mind. “Status” is such a worldly concept. Among other things, it is an exclusory conception. It is almost a synonym for exclusion, whereas Jesus is antonymical and inimical to the notion of exclusion. Which brings me back to your point about women and spiritual guidance. I think I’d like to reserve the right to recruit my “role models” wherever I find them, whether from among the quick or the dead, or indeed from among the Jew or Gentile, slave or free, male or female. I have very little use for the visible institutions that dare call themselves Christ’s Church, but that’s a matter that was settled, to my satisfaction at least, in mid-Nineteenth Century Copenhagen, and need not be rehearsed here. “There is neither Jew nor Greek, there is neither slave nor free, there is no male and female, for you are all one in Christ Jesus.” This is not a case of “male OR female” (interchangeable) but “male AND female”. The first two pairs are contrasts (qualifications of status – you could become a Jew, just as you could become a slave), the latter two are not, but part of our humanity! This verse (Galatians 3:28) is in reference to being one in Christ through Baptism. This verse often gets crowbarred out of context to serve a social political cause! Feminist point scoring – we can all do that! Yes Paul did write before the Gospels. Mark was probably the first Gospel, where the women are told about the resurrection and were instructed to tell Peter and the others – but as the text reveals; “and they said nothing to anyone, for they were afraid.”. Paul in 1 Corinthians 15:5 states that Peter was the first witness (this is circa ten years before Mark – the original apostolic tradition). Matthew who is known by modern scholars for his midrashic expansions makes good the story at the end of Mark (the additional verses to Mark added for the same reason), with Luke and John following! I guess now Paul will re-assume his reputation as a misogynist having been temporarily reprieved with a misreading of Galatians 3:28 – ah – such is life!